I wanted to send you a quick note to tell you how much Emma is enjoying your camp. She is having the time of her life! When she went to bed Tuesday night she was asking how many days she had left of the camp and I told her three days left, she said "I don't want it to end"! Thought I would share that with you! Christopher had so much fun at Camp Viva and he is already asking to go again next summer. Steve and I were really impressed at how much you guys did with the kids. Thank you so much!!!!! Scarlett had the best week ever and said she can't wait for camp next year! Honestly, she had the most amazing week. Look forward to seeing you next year! Julia is already looking forward to next year!! And she is hoping you add another week or 3! :) So glad Camp Viva had such a great year. You're the best!!! Thank you, Andrea!! 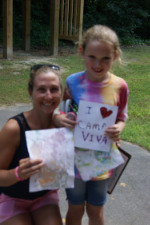 Lily really loved her week at Camp Viva and can't wait to do it again next summer. Thanks so much! They had a great week and based on all the fun things they brought home I can’t believe how many activities you did with them!! She had a wonderful time creating, moving at her own speed and proudly displaying her work. She's looking forward to next year! Nirmay enjoyed the camp very much! Look forward to next summer.